Well, that's it for Christmas and what a lovely time of the year it is. Harry is at such a lovely age and just loved every minute of it all. So now it's January and I guess before we know it, it will be January again. Our intention is to update each month a couple of times during that month so keep an eye out for these updates. So New Year's Day saw us again in the car for the trip from Cobar to Broken Hill. As this was a 500km day, (our biggest yet and hopefully forever) we got up and actually left by 6.00am Qld time (it was a miracle). It was still very hot at around 45 degrees, so the car was as good a place as any to be. The drive was not as bad as we thought it was going to be, and was very uneventful. Diesel prices have also been better than expected and we've have been paying around 123 cents / litre with the most expensive being 129.9cents/litre for a small top up. The car is going well, returning overall fuel economy last week of 17.4 litres/100 km (average use over 1,300 kms, all towing). Pretty happy with that and better than expected. Since leaving Bundaberg we have travelled 2,618 kms. The landscape on leaving Cobar was not as deserty as we thought it would be. A lot of trees and shrubs made for a pleasant outlook. By the half way mark the landscape started to change rapidly. No trees and fewer and fewer shrubs. It was also much hillier than we expected. By the 3/4 mark there was no trees or shrubs, all replaced by endless miles of nothing but orange sand and the odd piece of spinafex blowing across the road. We travelled through a very impressive dust storm and at one stage had to brake hard as a huge 'Willy Willy" crossed the road in front of us. I'm not sure if these things can do any damage to a caravan but we weren't taking any risks. The roads are excellent with endless kilometres of absolute straights, broken by the occasional hill. And over the hill was, you guessed it, more long, straight road. During the night the southerly change that was expected arrived and the temperature dropped by at least 15 degrees. The next few days saw very pleasant if not slightly cool morning temperatures. Off to the tourist information centre we went to get all the local gossip. It is a very modern centre with extremely helpful and friendly staff. There is a huge amount to see and do in town and in the surrounding area so it looks like we will be here longer than the expected 3 days. 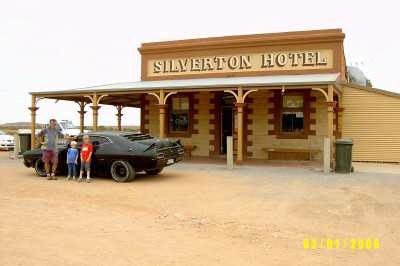 While the weather was cool we decided to go to Silverton, a small almost ghost town 35 kms out of Broken Hill. This was a very prosperous mining town prior to Broken Hill being settled, but is more famous now as it features in many movies, including Mad Max II & III, Priscilla Queen of the Desert, A Town like Alice and Dirty Deeds to mention a few. It's a very interesting place with a couple of unique Art Galleries, the Pub of course and the old jail which is now a museum. So much history in one small town. It was like something out of a wild west movie. That evening we went to see the 'Living Desert Sculptures' which consists of 12 large rock sculptures created by artists from all over the world. These are perched high on a hill overlooking the city and surrounding countryside. They are quite an impressive sight with a magnificent outback sunset as the backdrop for this canvas. The down side of seeing a sunset out here is that you are getting back to the van at 9-30pm. Day 3 off to do grocery shopping. For a city in the middle of nowhere the cost of living is probably cheaper than Bundaberg. Food, grog and even fuel are very well priced. Later that day it was off to 'Whites Underground Museum'. This guy is a retired miner and has converted his whole house and yard into a replica of a mine complete with all the machinery. 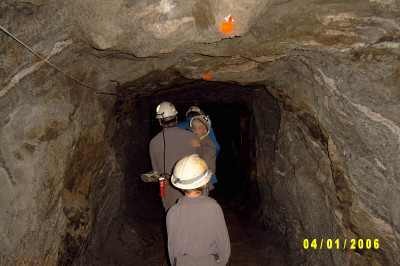 For the total sum of $10-00 per family you get the private tour and full explanation of how mines today and in the past operated. This was really great information explained using very large models. This turned out to be invaluable as on Wednesday we all went down Delprats Underground Mine. This was an actual mine that is now non-operational. We went 425 feet underground lowered down a shaft in a cage. As you can see from the photo we all had hard hats with lights. Mines have no other form of lighting. 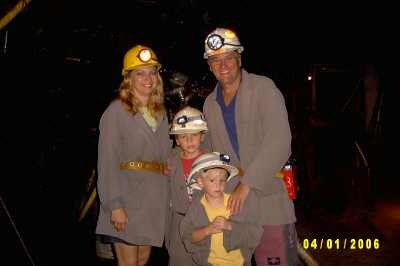 This is the way they do it in operational mines even today. In the good old days they used candles. This is how crazy our society is going. This mine is over 100 years old and is so stable they have never had a cave in. Going into this mine and walking the 1 km is infinitely safer than crossing a road or even getting out of bed for that matter. This great attraction will possibly have to close in April as their public liability insurance is due to rise yet again. Currently they pay over $500,000-00 per annum in insurance. Who ends up paying for that??? Us of course. Is this stupidity ever going to end? If it doesn't what experiences will our kids have to enjoy. Not many I suggest. We all thoroughly enjoyed the experience and gained a little understanding of how tough life was underground in years gone by. They really earnt their money and many paid for it with their life. Chris had a ball although was a little hesitant about the whole idea of being so far underground in a confined space. She is getting gamer as she gets older. Might have her bunge jumping by the time she is 50!!! Our final day was spent running around doing all the other things we haven't had time for yet. That included the 'Miners Memorial" which was interesting and sad. The youngest miner to die was 12 years old in 1885. We then visited the 'Royal Flying Doctor Service" which was a real eye opener and then a walk of the main street. Broken Hill is an amazing city and one that everyone should experience. This is a city that has survived through blood, sweat and tears and is a part of what makes Australia so great. If you haven't been here make sure you do and allow at least a week. The people and the place will be worth the effort. Tomorrow (Friday) we are off again. Most likely to Peterborough or Port Augusta. We are frantically eating all our fruit as we have to go through the 'Fruit Fly Gates' just down the road. Regular we will be!! One of the great things about this caravan park has been that we have been able to log on to someone's Broadband Wireless connection. Not sure who's but we have been on the net everyday and this has allowed us to update the web page faster than expected. We will miss 24/7 FREE access. As we had an early get away we decided to just have a good look around Peterborough and push onto Port Augusta. Peterborough was a very cute old railway town with train memorabilia everywhere. Harry wasn't sure which way to look. There are 4 main roads into town and each has a large scale model of a train to greet you. 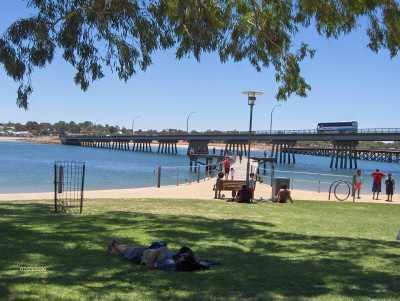 We had lunch in the local park and it was then off to Port Augusta. This is a pleasant city (second largest city in South Australia) very much orientated around water. It is at the very tip of Spencer Gulf and this expanse of water seems to be everywhere you look. Now for today's trivia. Spencer Gulf around Port Augusta is a 'Reverse Estuary'. In simple terms it means that the further you go up (North) into the Gulf the saltier the water becomes.This is due to the very small amount of fresh water entering the Gulf. In fact around Port Augusta the salinity is around 44.8%, which means bloody salty. In fact the fish life need to adapt to be able to survive. After a swim you come out looking like the abdominable snowman, completely covered in salt. A little unpleasant. Well you won't believe our luck. The day we arrived at the caravan park I opened up the lap top and bugger me we had FREE wireless broadband internet connection again. Two caravan parks in a row. Sure hope this continues!! This city has had for the past couple of years a female Mayor, and boy does it show. As with other towns with a female Mayor this place has just gone ahead in leaps and bounds. The new foreshore developments and parklands are as good as any we have seen. The chain reaction is obvious with all sorts of building and civic pride taking over what was, we are lead to believe, a bit of a grotty place. The caravan park that we were in was right on the water and overlooked the other side of the Gulf to the main railroad depot for South Austalia. Talk about a lot of very long trains coming and going. We saw 'The Ghan' and many others on their way North, South, East and West. It kept us all (but especially Harry) very entertained. After 4 days it was off to Whyalla, a big 70 kms down the road. This is another large industrial town with plenty to see. We checked out the local caravan parks and chose one right on the water. The park was terraced with the lowest level being on the water. We were very excited to see a lot of vacant sites on the water and we couldn't work out why everybody was jammed in on the upper terrace furtherest from the water. Bloody stupid New South Welshmen. Wouldn't know a good site if they fell over it. Anyway we set up and sat down as proud as punch having a cuppa looking out at the magnificent turquoise water when it started. Wind, wind and more wind. Within 30 minutes of us arriving it was blowing 40- 50 knots and didn't let up for 3 days. It was so windy it blew my coffee out of the cup. True story. We have since found out Whyalla means "windy place". I am sure the New South Welsmen had the last laugh at the stupid Queenslanders. We live and learn. Except for the wind (Gale) there is a lot to see and do. Lookouts, beaches, Marinetime Museum, Steelworks, Lighthouses and the list goes on. The highlight of our visit was a 2 hour tour of the steelworks. About 14 people jumped onto a mini bus and off we went . The tour guide was great and in a past life actually worked at the site. 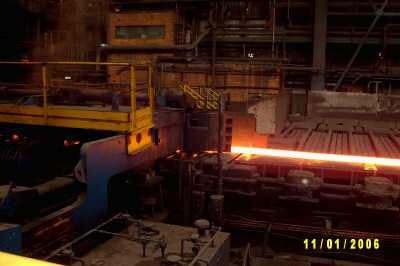 We saw every part of steel production up close and personal. It was a facinating insight into how incrediably complex the whole production process is, and as said before was the highlight of our trip to Whyalla. After the steelworks we did a tour of the HMAS Whyalla which is now housed at the information centre. It was the first ship to be built in Whyalla in 1941 and served in WW II. Following the tour we went to the Maritime Museum and learnt more about the history of this town. The next day we went for a drive to Lowly Point. What I thought was going to be a fairly boring drive to see a lighthouse turned out to be very interesting. The first point of interest is that this small rocky outcrop complete with a lighthouse is the world's largest breeding ground for Giant Cuttlefish.I must admitt to being a bit ignorant when it comes to these creatures but must say the are a facinating animal. The other thing of interest and something I am sure we will see a lot more of is fish farming (Aquaculture Industry). A couple of hundred metres off shore are 30 fish growing enclosures. These large rings are 16 metres in diameter and 8 metres deep. 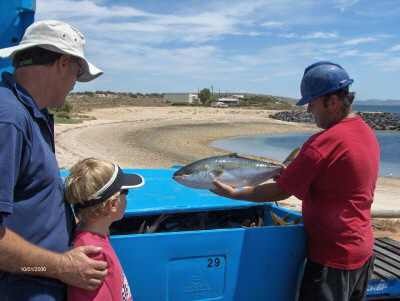 Each enclosure holds approx 8,000 yellowtail kingfish (a total of approx 450,000 fish). These guys are put in as babies about 2" long and take 18 months to grow to full size. There are thirty people working at this site going 7 days a week. They feed the fish everday except during winter (then every couple of days) using a machine that blows pellets into the enclosure. Each enclosure uses $500-00 per day in feed. Then every 20 days they replace each net as they get a build up growing on them. These are then cleaned and reused. Most days they harvest the fish and put them in an ice slurry and transported to town. As you can see from the picture they are a good size fish. Not sure what each fish wholesales for but must be a fair bit to cover the expenses. Each blue esky above holds 120 fish. They harvested 960 fish this day. The guy was telling us just a few days ago a couple of bull sharks ripped a hole into one of the nets and had a field day as you can imagine. The fish that didn't get eaten swam away. I would hate to think how much money they lost that day! The rest of our stay in Whyalla consisted of visiting lookouts, going shopping and spending the afternoon at the local Sports and Leisure Complex. This complex is amazing. All indoors, it has a 50 metre pool, a great adventure kids pool with water mushrooms, a big waterslide and huge gym. Alex and Harry played for hours and came out looking as wrinkly as me. We left Whyalla and headed for Cowell (110km-A big day in the car). This is a very cute little town half way down the east coast of the Eyre Peninsular. We had booked into the local caravan park by 11-00am so had the rest of the day to sightsee. On our list of places to visit was Port Gibbon. At the end of a good 22km dirt road is the little settlement of Port Gibbon complete with a free camp right on the water with a great toilet block and town water. We had intended to move on to Port Lincoln in the morning but will now go to Port Gibbon instead. A couple of old locals look after the place and greet you on your arrival. There are only 6 other vans here and each afternoon everybody meets under the big tree at 4-00pm for happy hour. An extremely friendly bunch. Plan to spend a few days here just to relax and do nothing (That will make Mum happy as she is worried that we are doing too much). A couple of kms down the road are huge sand dunes. We all spent ages climbing and attempting to toboggan down the hill on an old beer carton. It wasn't very successful but sure was funny. The beach at the point also has a few resident Sea Lions and not to be disappointed one was sitting on the beach on our arrival. Chris being the great naturalist that she is was convinced it was dead, and nearly had a heart attack when it moved. This guy was very used to people and wasn't at all worried by our activities. I think this is the first time I have seen one in the wild. As you can see from the photo this guy was a bit of a show pony. Without a lie as soon as Chris got the camera out he sat up and did a few poses. As soon as the camera went away he laid back down and went to sleep. Amazing. Not sure what our next stop will be as there are so many little seaside villages between here and Port Lincoln. Guess we will make it up as we go along. We ended up spending 3 nights at Port Gibbon and if left up to Chris we would still be there. It was a good relaxing few days but was time to move on. On the way down the coast we dropped into a number of small seaside villages (Arno Bay, Port Neill) and had a good look around. There really are some beautiful villages in this area all with their own charm, the old fishing shacks, the tractors lined up on the beach and a friendliness you can feel. We think we have it all in Queensland but let me tell you this area has a lot to offer. If you are into boats and fishing this part of the world is heaven. 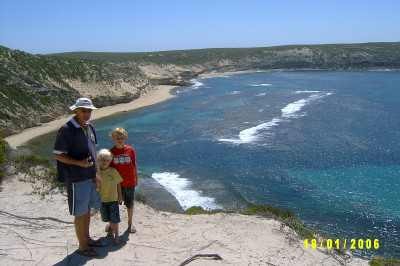 We had been told about a little free camp called "Lipson Cove" and thought we would visit it for lunch, as we had made up our minds to get to Port Lincoln. When we came over the last hill on this 20km dirt road both our jaws dropped. In front of us was the most beautiful beach with sand so white we thought we were on "White Haven Beach" in the Whitsundays. The water was as turquoise as is possible, so beautiful, laid out in front of us like a canvas of perfection. There were only two other vans to be seen so we backed into a spot for lunch, both of us knowing full well we will not be leaving here today even though we are short on water, have no bread and very little milk. We'll manage.... Once on the beach there was no leaving. We swam, threw the frisbie and made sand castles all afternoon. There was one other couple on the beach with two boys of similar age to ours . The kids played together and we chatted. They turned out to be a lovely couple from Melbourne who were on their way home from a christmas visit to Perth. We had drinks with them that night and breakfast with them the next morning, but then alas we had to set off. We dropped into Tumby Bay which is another very cute picture perfect village. Next stop- Port Lincoln. This is a city that has appeal the minute you drive into it. It oozes with wealth and that shows in it's facilities. There are more millionaires here per capita than anywhere else in Australia. This is the "Seafood Capital of Australia". The beautifully manicured green foreshore with alfresco dining for endless kms is very appealing. The shopping is excellent as is the Caravan Park we are staying in at Kirton Point - with each site having a view of Boston Bay. There is a lot to do so we will most likely be here a week hob nobbing with the rich and famous. The "Tunarama Festival" is also on so we will stay for that. Memory Cove was a very pretty beach and as it was a fairly hot day a swim was the order of the day. Well, one thing we must say about the water down here is that it's awfully cold!! Shrinkaage +++. In this Cove we saw not only Dolphins swimming around but also sea-lions. We met another nice couple here with 3 kids also much the same age as ours. They are heading in the same direction (across to WA) as us so we may bump into them again. The next few days saw us doing another drive, a few walks and a tour of a local fish processing factory. This tour was really interesting as we not only learnt a lot about fish, how to fillet and how they package and export, but also a lot about the seafood industry. You might find some of this hard to believe but it is true. To sell any fish for money you need a fish licence. This is pretty cheap and will set you back about $200,000-00. We can all afford one of those. If you fancy the life of an Abalone fisherman that licence will cost you around $10 million. Most of these guys catch their yearly quota in 50 days!!! Not sure what they do for the rest of the year. Then you enter the big league. If you want to buy a Tuna fishing licence it would cost you in the billions. Yes billions. It's hard to believe this is possible but there you have it. (No-one knows the exact figure as they rarely come up for sale.) A few families have these licences (Lukin Bros are one - you may remember Dean Lukin the Olympic Weight Lifter) and these have usually been in the family for generations but most of the licences now are owned by large companies. Now it would seem that paying for the tuna licence could be the cheap part, as what they have to do to get this fish to market is amazing. Firstly the tuna boats are huge. Well over 100ft. Nobody has yet been successful in breeding tuna in captivity, therefore they have to go out and collect them from the ocean. These very large boats take off many many hundreds of miles into the ocean. Then with the assistance of spotter planes they locate large schools of tuna. They then run huge nets around the tuna and trap them. The next step is to build a large floating frame onto which this net is secured. This floating enclosure can be up to 20 metres in diameter. Then they have to tow the whole thing back at a speed of around 1 knot, slow enough not to hurt or even mark the fish in any way. This can take 6-8 weeks. All this time the tuna are fed pilchards twice daily. When they get back to Port Lincoln the nets are secured off the coast. The same people also have huge pilchard boats that go out every night to catch tonnes of pilchards to continue feeding the tuna twice daily. When the tuna get to export size a diver goes into the enclosure and selects each fish individually. He then places his hand into its gills (so as not to bruise or mark the fish - the Japanese will not accept anything with blemishes) and gently guides the fish to a chute. The fish is then given a fatal electric shock between the eyes because if the fish gets stressed the flesh becomes discoloured. None of these fish will be sold on the Australian market - all these fish are for the Japanese market and must be in Japan within 24 hours of being caught . We get the rejects! Each licence only allows you to catch and sell 8,000 tonne of Tuna. Not a lot when you think of the expenses these guys have. A few months ago a big White Pointer shark got into one of the nets and didn't want to leave. As these sharks are protected it couldn't be killed. A diver had to go into the net with the shark and try to persuade it to leave. Apparently he did this successfully and lived to tell the tale. Hope they paid him well!! Right in the middle of town is a very long grain loading jetty. It would be well over a km long. Late one afternoon we went out for a walk to see the fishing boats coming back in from their trips. Watching the pilchard boats pumping out the catch onto semi trailers was amazing. A couple of Fisheries Inspectors spotted us and came over for a chat. Really nice blokes and very willing to give us a running commentary of what was going on. Alex was more impreseed with all the gear hanging off their belts. Handcuffs, capsicum spray and other bits and pieces. We found out these guys have the power to arrest people. I don't know if they can do that in Qld. Must check with the Baldrys on that. The Inspectors sent Alex over to the Pilchard boats to ask for some pilchards for bait. They were very willing to give him whatever he wanted. We now have a freezer full of bait!! There were people everywhere on the jetty fishing for salmon and just pulling them in one after another. Apparently the salmon follow the pilchard boats into shore. The water was alive with them. We started chatting to an old guy who was fishing and he ended up giving us 6 good sized Salmon. Very friendly bunch around here. Back home to fillet the fish and onto the barbie for tea. They were beautiful - can't get much fresher than that either! After nearly a week in Port Lincoln it was time to again move on. Port Lincoln as I have already said is a great town and one that we could easily live in. This place is an absolute must to visit. Our next stop was Elliston on the western side of the Eyre Peninsular. Again this 100km trip took all day as we had a number of places to see on the way. First stop was Coffin Bay. How can so many great spots be jammed into one little Peninsular? We pulled up at the local lookout to discover a tonne of smelly smoke pouring out from under the car. Oh great!! Had a look under the car and couldn't even see where it was coming from. Not much else to do but push on and see what happens. No more smoke but still a strong brake/clutch smell around. Turns out to be the handbrake assembly so either I drove with the handbrake on slightly or something is wrong with it. Will take it into the Nissan agent in Ceduna. Boy was I relieved. Thought the gear box had chucked in the towel. Next little detour was to 'Farm Beach'. Absolutely nothing here except for this really long beach with dozens of vans and motorhomes set up in the sand just above high water mark. Have never seen anything like it. No toilet, and nothing but sand everywhere. Not my idea of an ideal camp site. Apparently it is one of the last places you can actually camp like this as the EPA has shut down all the rest. No doubt this will also get shut down eventually. Finally arrived in Elliston late in the afternoon and booked into a lovely park in the midle of town. Only planned on staying one night but ended up staying two. Elliston is the beginning of 'The Great Australian Bight' and the scenic drive was impressive. This area is also renowned for having fossils called 'Weevil Cocoons' which resemble Dutch Clogs. These are said to be 40,000 to 100,000 years old. They are all over the place so we collected a few good specimens to help weigh the van down even more. A big industry in this town is Abalone aquaculture. Abalone can be bred in captivity and then placed in nets in the ocean to mature. This is a very slow process taking many many years but is becoming more popular because no licence is required as they are not harvesting from naturally occuring stocks. One of the other highlights of Elliston was the fact that we finally got a haircut. As you can see from the photo below we were a little overdue. I almost feel human again. Our next Port of call is Streaky Bay and we will most likely see out the end of the month here as we are due for a bit of down time. I know you are all going to laugh but constant sight-seeing is tiring. As always we had a few detours on the way. Our first stop was 'Talia Caves' which are large caves that have been eroded over millions of years by the sea and wind. These are at sea level and fill with water on high tide. An impressive sight. Next stop 'Venus Bay'. Some people we camped next to in Port Gibbon go here for two months every year to catch 'King George Whiting'. The village is situated on a huge naturally occurring harbour-like bay. You only come here to fish, fish and fish. Next stop was 'Murphy's Haystacks' which are huge granite boulders all of different shapes (Inselbergs- for those geologists out there). They stood out like dogs _____ on this otherwise completely flat landscape. The kids had a ball trying to climb these very slippery devils. I could see a broken arm coming on but luck was on our side and the only injury was Harry splattering his testicles across a rock. He let out a yell that you possibly heard in Bundy. 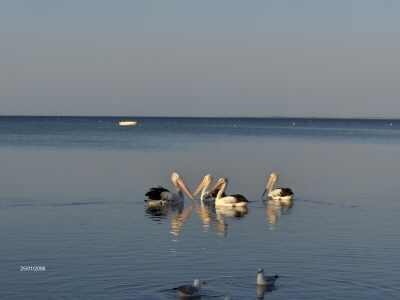 Streaky Bay is one of those places I read about years ago and has always stuck in my mind as a place to see. Well I wasn't disappointed and it was worth the wait. Only a small town of 2,000 people but has good shopping, a good pub, lovely beaches and a great bike path. We had a couple of accommodation choices. One was the only caravan park and the other a free camp 19km north of town. The caravan park is right on the beach and really well maintained. As the temperatures are expected to be in the high 30's the thought of power and the air conditioner sounded attractive. We had a family vote- All in favour of power. Motion carried. The back of our van is actually in the sand with high water mark only a few metres behind us. We again met up with the family we met in Port Lincoln so the kids are having a ball. A nice spot to veg out for a week. Australia Day was spent in town on the foreshore parklands having a huge free bacon, sausages and egg breakfast and watching the awards ceremonies. It was a lovely morning in a very lovely town. Over the next week I hope to be eating plenty of local oysters, my goal being at least a dozen a day (current price is $5.00 per dozen). Across the road from the caravan park is the local pool and the District Library that has free internet and they allow you to plug in your own laptop. Now here is a funny little quirk. Large towns and cities will not under any circumstances allow you to connect your laptop into their system. The really small towns, no worries. Why the difference and why are the small towns so much more obliging? These bigger places need to move with the times. Bundaberg is still the only place we have found that provides free wireless connection for the general public. Good on ya Bundy. Well we did end up seeing January out in Streaky Bay and we really didn't do much. I got my oyster fill and Chris managed to catch up on diary writing and a bit of craft. We did a few drives and checked out the local attractions. I can see myself owning the local Post Office in Streaky Bay that has panoramic views of the bay and one day being the Mayor. Dreaming is free. Our next stop will be a brief one in Ceduna and then the big crossing of the Nullarbor. Interesting times ahead. As a lot of you are aware a lot of planning went into this trip. We were able to get lots of information on everything except "What will it cost?" We came up with a budget but it was based more on guess work than fact. For that reason at the end of each month we will give a brief summary of what our expenditure is. For anybody planning a trip regardless of how long this will be helpful. Our weekly budget breakdown is $250.00 on diesel, $250.00 on site fees and $350.00 for everything else including food, grog, sightseeing entry fees and special treats. That is a total of $850.00 per week. So how are we going at the end of week 7? We are well under in fuel costs. Every week we have been well under budget and currently are in credit for $588.00. Much the same in site fees. We are currently in credit for $570.00. A bit of free camping and using our park memberships (Big 4, Top Tourist and FPA) has helped us out here. Our $350.00 per week living expenes is pretty well spot on. We are doing everything we want to do but at the same time being careful and mindful of the budget. An early estimate would be that our total weekly expenditure would be around $600.00 per week. Of course there are going to be times when we will have fuel blow-outs but am hopeful that we can keep our weekly expenditure well under our initial budget estimate. We have used 875 litres of diesel since leaving Bundaberg averaging 17.5 litres/100 km fuel consumption. This is a little higher than hoped due to some very strong head winds. Well, that is it for January. We have already seen and done so much , and with so much ahead. We are all adapting well to the carefree nomadic lifestyle and to date no major problems.We have all become a little lazy sleeping in to around 8-00 to 8-30 each day. Enjoy it while we can. Be kind to each other. Catch you soon. Avoiding the phrase “I don’t have time...”, will soon help you to realize that you do have the time needed for just about anything you choose to accomplish in life. How true. Get out there and live that dream.